During her time at the University of Louisiana at Lafayette, Erin was a main anchor for Acadiana News 1. Erin first reported as an intern for WRBH 88.3 FM – Reading Radio For the Blind & Print Impaired. 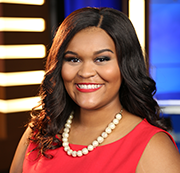 Later in her college career, Erin interned for the number one television station in New Orleans, WDSU. Erin was also a member of Sigma Gamma Mu- Communications Honor Society. When she’s not working, Erin enjoys spending time with family, dancing, visiting friends and trying new things. After living in Acadiana for four years, Leigha has grown to love Cajun Country just as much as her home town. She lives to tell hard hitting stories that raise awareness to issues in the community. She also loves the occasional uplifting, inspirational story that gets the water works going. When she’s not reporting she is spending time with her friends and family, cooking, or taking her children Sonny and Leo on long walks downtown. Leigha has also volunteered with Hearts of Hope, a sexual assault relief non-profit organization. Megan grew up in Farmington Hills, MI and received her broadcasting degree from Grand Valley State University. 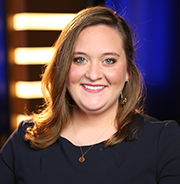 Shortly after graduation, Megan landed a Traverse City bureau reporter position at Fox 32 News. While in Traverse City Megan volunteered at Father Fred Foundation and as a big at Big Brothers and Big Sisters of Northwest Michigan. She is also a member of the National Association of Black Journalists.